A few weeks ago I wrote about my dilemma with the fishermen in Arisugawa Park. They were upset with me because I had taken a few pictures of them without asking permission. I felt terrible about it and at the recommendation of Ken and friends, I made a 2010 picture calendar on my computer and included photographs from Arisugawa for each month. Yesterday afternoon the Apple computer box came in the mail with five wall calendars inside. On the front was a picture of a single turtle in the pond and on the bottom it said "Photographs for the Fishermen of Arisugawa." Yumiko and I got up early this morning determined to take the calendars and face the fishermen. I hoped when we got there, my fried Jou who knows all the fishermen would be there to help give us courage and smooth our way. We got there about 7:45 and there was Jou. She rushed up saying, "Where have you been?" She knew I had stayed away because of the fishermen. She said she had talked with them over the last few weeks and they were no longer upset. She said she showed them the picture book I made for her and they liked it and had fun identifying some of the cats and ducks and birds that were included in the book. I showed Jou the calendars and told her we wanted to give one to each of the fishermen. She said, "Come on, I know where they are." We followed her through the park to one of the wooden bridges where a few of the fishermen were gathered. She marched up to the head guy and introduced me to him. He was a rather young man - very outdoorsy and weathered looking. He looked me over and basically said it was O.K. that I took the photographs. I bowed and apologized and then took out the calendars. Jou translated that they were a gift and the head fishermen laughed and smiled and talked to his buddies and they were all very happy. He then took out his cell phone and showed me pictures he had taken of the turtles. 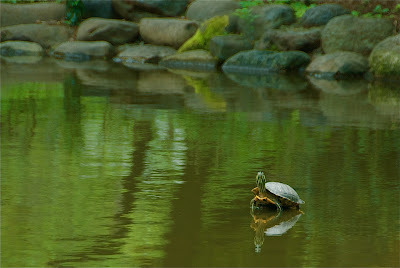 One of his photos even included a turtle laying an egg somewhere in the park. It was marvelous. I told them we were leaving on Tuesday to go back to the U.S.A. They asked when we were coming back and said they hoped I would come back to Arisugawa. We handed around the calendars. Everybody ooed and aahed and were very appreciative. I hugged Joe, bowed again to the fishermen and we all said good bye. It was truly great to bring closure to this episode. Hopefully, we will see them all again on our next trip back to Japan.